This is thought to be the first production J-20 fighter, and was recorded outside the Chengdu Aircraft Company’s factory last December. China’s Chengdu Aircraft Company (CAC) has built more Low Rate Initial Production (LRIP) J-20 stealthy jet fighters, with another new aircraft featured in flight on Chinese websites over the past week. 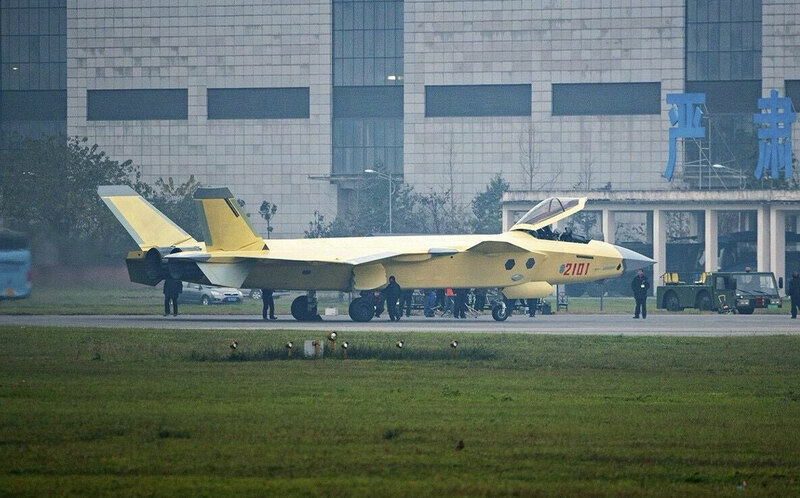 This is the second known J-20 LRIP aircraft, after the first example serialed 2101 was shown in late December 2015. They follow two prototypes and six known development aircraft that featured a successive series of refinements. The latest aircraft is painted in shades of gray and carries toned down national insignia, but unlike all previous J-20s has no identifying serial numbers. Reports from China suggest that this latest aircraft may in fact be the fourth LRIP aircraft, but verifiable evidence of this has yet to surface. Most information about the J-20 has emerged from unofficial Chinese websites, and the type has never been shown in public. The appearance of LRIP aircraft suggests that the type is nearing introduction into service with the People’s Liberation Army Air Force. A number of J-20s have been seen on satellite imagery at the China Flight Test Establishment base at Xi’an-Yanliang. The latest report to Congress on Chinese defense developments by the U.S. Department of Defense suggests that the J-20 could become operational in 2018. The J-20 appears to be designed for long-range interception with an emphasis on frontal-aspect low-observability. It has an infrared search and track sensor and possibly also an electro-optical distributed aperture system (EODAS), the latter a Chinese-designed system similar to that on the Lockheed-Martin F-35 Lightning II stealth fighter. The weapons are carried internally, with a central bay expected to contain four beyond visual range air-to-air missiles (BVRAAMs). There is also provision for two short-range AAMs in two separate weapons bays on each side of the fuselage. The main question that is left for the design is the powerplant, with all J-20s built so far being powered by two Russian Saturn AL-31 engines. China hopes eventually to install 180-kN (40,000-pound-thrust)-rated WS-15 turbofans. But China’s jet engine development program has been stymied by manufacturing and reliability issues. Even the less ambitious WS-10 turbofan is yet to fully enter service with the single-engine Chengdu J-10 fighter, although it has been flying on the twin-engine Shenyang J-11 Flanker since 2010. Meanwhile, Chinese websites have also shown what appears to be a second J-31 stealth fighter leaving the Shenyang Aircraft Corporation factory by road, covered in tarpaulins. The prototype J-31 was similarly recorded, before its first flight in October 2012. This type is being marketed for export as the FC-31. At the Dubai Airshow last November, a Chinese official told reporters that the FC-31 would be powered by Chinese engines. The prototype was powered by two Russian RD-93s.